Home › Electronics › Iphone 7 Case Tech Armor Apple Iphone 7 Flexprotect Case Grey/Clear - Perfec..
Iphone 7 Case Tech Armor Apple Iphone 7 Flexprotect Case Grey/Clear - Perfec.. DESIGNED FOR APPLE IPHONE 7 PERFECT FIT FOR NEW PORTS. WHAT IS TECH ARMOR FLEXPROTECT? Experience complete protection with this protective case. The FlexProtect dual material design offers excellent shock absorption and scratch resistance while maintaining a slim, clear profile. HOW DOES FLEXPROTECT WORK? The soft TPU absorbs and redirects impact forces around your iPhone 7, while raised edges protect the screen from scratches. Compatible with Tech Armor branded lightning cables and ALL Tech Armor screen protectors. EASY TO PUSH BUTTONS Perfectly designed buttons and ports won't interfere with your iPhones operation. WEVE GOT YOU COVERED - We offer a non-warranty, paid replacement policy for customers that break their Tech Armor case or just need a replacement from normal wear or tear. 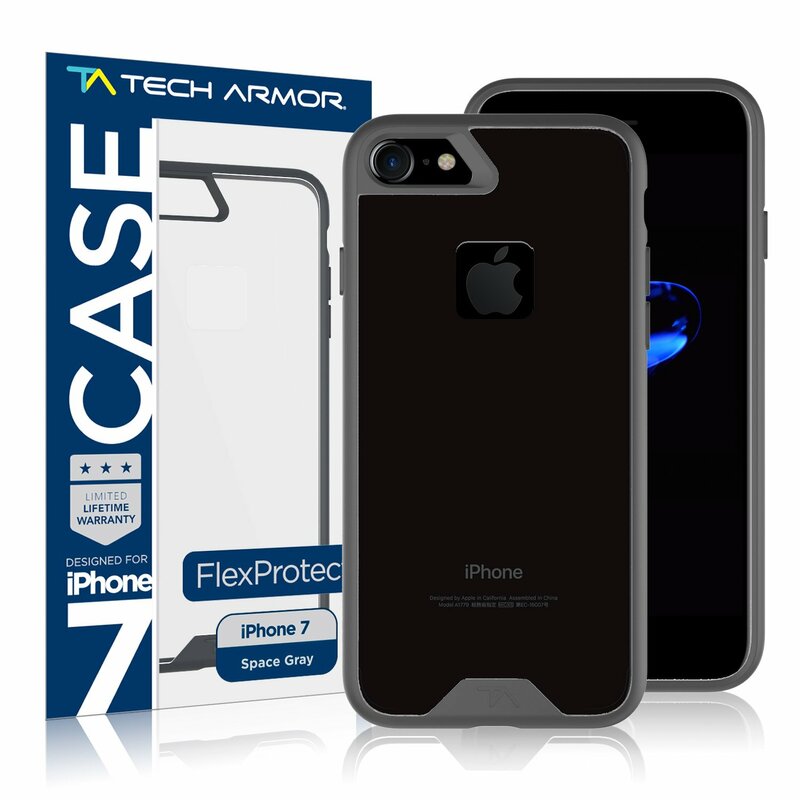 Color:Frosted Space Grey Wrap your iPhone 7 in complete protection with theFlexProtect case from TECH ARMOR! Protect your iPhone 7 against the inevitablebumps, drops, and scratches that mobile devices experience daily. Made fromlightweight, yet tough TPU material, this case provides durable protection andshock absorption without weighing your phone down. The tactile finish makes iteasy to handle and decreases your chance of dropping it, while the clearexterior shows off the beauty of your iPhone 7. Our soft touch TPU isengineered with precision lift to ensure your iPhone 7 display glass does notscratch when face down and your camera remains untouched when face up. Theseamlessly designed FlexProtect Case glides on easily for a perfect fit,delivering instant access to buttons and ports, without camera or speakerinterference. We want you 100% Satisfied with your Tech Armor Purchase! Ourcommitment to you is that we will keep your device protected, the TECH ARMORWAY, or your money back. COMPATIBILITY: Apple iPhone 7 (NOT 7 PLUS), AllModels, All Carriers. Works with All Tech Armor Screen Protectors and workswith all Tech Armor, Apple, and Amazon branded lightning cables.